If you have about $3 million laying around and looking for a new crib, you might want to consider the Cullen's house they used for filming in New Moon. Of course you'd have to move to Vancouver. Hmm.. I wonder if any of the Cullens would come visit?! hehe To take a tour of the house click here. Bitten by Ginger @ GReads! at 6:37 PM 3 enjoyed the bouquet. Photos taken by this guy. Who am I kidding? like I could go a whole week without posting an RPattz pic :-) He's been voted #5 by GQ for "most important people in menswear". Bitten by Ginger @ GReads! at 12:55 PM 2 enjoyed the bouquet. Just curious if anyone has heard anything about the soundtrack for Remember Me? I am a sucker for good music in movies and was curious to hear what songs they'd choose for this movie in particular. I know they play this song during the trailer, but it's the only one I've heard. I've even tried googling for a soundtrack and haven't had any luck. Bitten by Ginger @ GReads! at 6:29 PM 0 enjoyed the bouquet. Bitten by Jes at 5:20 PM 2 enjoyed the bouquet. Bitten by Ginger @ GReads! at 2:00 PM 5 enjoyed the bouquet. Bitten by Jes at 8:19 PM 4 enjoyed the bouquet. Behind the Scenes of Remember Me! Bitten by Jes at 11:10 AM 5 enjoyed the bouquet. City of Fallen Angels Sneak Peek!! Here is a sneak peek at the chapter titles for Cassandra Clare's book, City of Fallen Angels... the spin-off from The Mortal Instruments. In which Simon, who has been trying hard to live as normal a life as he can, finds out that's not going to be possible any more. This is the chapter that will be included in the paperback copy of City of Glass, so I won't say much about it, except it's Clary's POV. And the Lord said unto him, Therefore whosoever slayeth Cain, vengeance shall be taken on him sevenfold. And the Lord set a mark upon Cain, lest any finding him should kill him. Well, that whole Mark of Cain business wasn't just going to go away. This one contains a training sequence that involves Muay Thai, a martial art that's called "The Art of Eight Limbs" because it involves using hands, elbows, knees and feet as strike points. This is also the chapter that contains the quote from the Seelie Queen I Tweeted — the one about "he's bound to you, but does he love you?" This is Latin, from one of the Psalms, abyssus abyssum invocat. Also translated as "deep calls unto deep." In which Clary tries on a bridesmaid's dress. To see the rest click here. Bitten by Ginger @ GReads! at 2:04 PM 9 enjoyed the bouquet. Who doesn't love racy teen lit? Via twitter, Cassandra Clare tweeted about Glamour magazine mentioning her books, The Mortal Instruments. The article goes on to express a guilty pleasure of loving to read racy teen lit. Read it here. As stated in the article, the author says she's embarrassed to admit to reading teen lit. This I could relate to and it made me wonder who else felt this way? 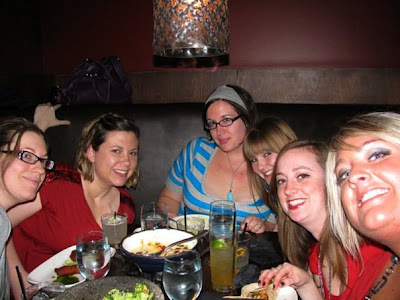 I know some of our followers ARE teens, and it's totally acceptable for you all.. but what about the oldER crowd here? Bitten by Ginger @ GReads! at 1:56 PM 5 enjoyed the bouquet. To see more from their Vogue photo shoot click here. Bitten by Ginger @ GReads! at 12:54 PM 0 enjoyed the bouquet. Hot Vamp of the Day! Bitten by Jes at 10:16 AM 3 enjoyed the bouquet. A Belated Happy Valentines Day from the SVC! 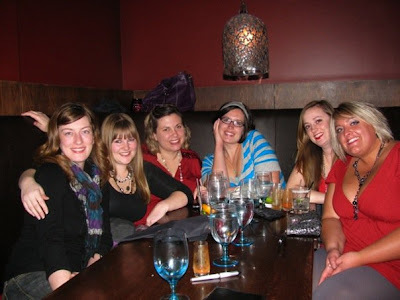 This past weekend the SVC MN coven leaders celebrated Kari's birthday in style! 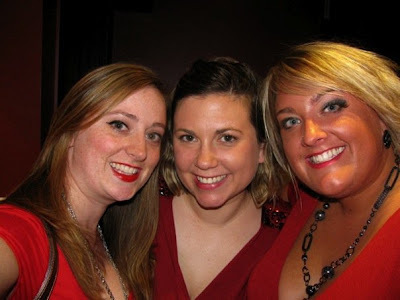 Here are some pics from our Bday Valentines Night Out! 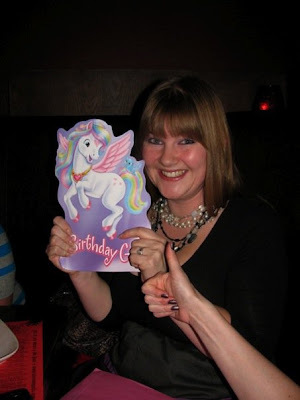 Kari and her magical bday card! Bitten by Jes at 3:03 PM 4 enjoyed the bouquet. Our first glimpse of Bryce Dallas Howard as Victoria... what do you think? Bitten by Jes at 2:57 PM 10 enjoyed the bouquet. This was a big episode! To be totally honest I didn't see the ending coming, and kudos to the writers for that! Best Damon Line: This episode did lack in witticism from our dear snarky hunk of a vamp, but where Damon lacked in sarcasm he made up for in pure heartbreaking facial expressions. I love this vamp, and I felt his agony in the fact that Katherine was not in the tomb-- didn't see that one coming. I probably should have, but I couldn't imagine the boys not being aware of her or running into her at some point in all these years since the tomb has been closed. best line of the night from Damon: "Fool me once, shame on you." Hottest Stefan Moment: Once again I give out a "Most like a Buffy show" award-- when he picked up that fire blaster and aimed it at Sean Ferris (no clue what his character name was--oh, Ben)Holy crap! He was so hot! Biggest Surprise of the Epi:I think that the whole tomb experience was a bit of a shock-- I've been wondering what would actually happen, what the experience would actually be when the tomb was open. I thought it was true to vampire lore that the trapped vamps were just wasted shells of them self and yet still alive. I think the tomb scenes were done well-- The big shocker of the epi was the fact that: KATHERINE WAS NOT IN THE TOMB! And even more crazy, she has been around, just wanting/caring to see Damon. I am positive that there is more to it than that, but that's what we are to believe at this moment, since that is what Damon is feeling/thinking. Other Observations: I got a strong Bells/Twilight feeling when Jeremy got up from his bed at the end of the epi and started a google search on vampires. I wanted some crazy Twilighty soundtrack music to be playing in the background. Discussion Question: I think we are all wondering about Katherine and what the story is with her-- BUT I find myself wondering about Bonnie and how the death of her grandma will affect her after she has died from doing a spell she pretty much begged/pleaded her grandma to do even when she didn't want to/ What are all your thoughts on that? Do you think Bonnie will turn all Bad witch on us, like "Black Evil Willow (buffy reference)? Bitten by Jes at 9:34 AM 12 enjoyed the bouquet. ...when you buy the New Moon DVD from Wal-Mart. Ulti­mate fans of Twi­light have a rea­son to howl with excite­ment: a sneak peek at The Twi­light Saga: Eclipse. Wal­mart announced today it will be the only retailer to carry The Twi­light Saga: New Moon Ulti­mate Fan Edi­tion on stan­dard DVD, and Blu-ray, with never-before-seen footage from the upcom­ing The Twi­light Saga: Eclipse. Bitten by Ginger @ GReads! at 2:24 PM 2 enjoyed the bouquet. Taking care of this awesome baby! Bitten by Ryah at 1:36 PM 6 enjoyed the bouquet. Bitten by Ryah at 1:31 PM 9 enjoyed the bouquet. Taylor is 18! Happy birthday, my legal pup. Bitten by Kari at 12:12 PM 4 enjoyed the bouquet. IT'S A "REMEMBER ME" ONE!!! Bitten by Jes at 9:42 PM 1 enjoyed the bouquet. Bitten by Erin at 6:52 PM 1 enjoyed the bouquet. A dude and his guitar is HOTT. **Edit: you can see more RPattz pics from his upcoming movie here. Bitten by Ginger @ GReads! at 9:39 AM 1 enjoyed the bouquet. Question of the Week: Setting Unrealistic Expectations? "...it’s ruining the next generation of women by teaching them that guys should be moody jerks who twinkle in the sunlight while being borderline abusive due to an insatiable bloodlust..."
Thoughts? They have a list of ten movie characters that set unrealistic expections of men by women at the above link. Does anyone really expect their husband to be Edward? Does anyone even WANT him to be? Bitten by Erin at 2:57 PM 5 enjoyed the bouquet. Here are 2 new pics from the movie... what do you think? Bitten by Ginger @ GReads! at 2:53 PM 14 enjoyed the bouquet. Finally- I'm blogging about Vamp Diaries!! "If I see something I haven't seen before, I'll throw a dollar at it." There were quite a few moments where we got to see our beloved Stefan shirtless, but for some reason I found the moment where he caught the spike shot by Alaric extremely hot. What do you all think of the trust issues between Damon and Stefan?? Were you surprised to hear that is was Stefan that first broke the trust between the two bros? Bitten by Jes at 10:27 AM 12 enjoyed the bouquet. 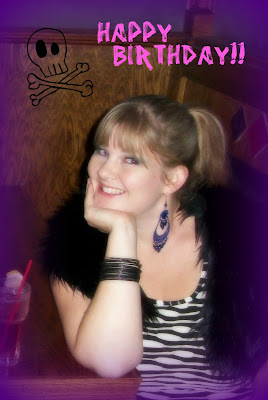 If you read Wicked Game and Bad to the Bone by Jeri Smith-Ready, then you may want to check out her next book: Shade. Also she has posted Chapter 1 for an early preview. You can read that here. Bitten by Ginger @ GReads! at 8:02 AM 5 enjoyed the bouquet. Where's Carlisle when you need him??? So...it may seem like it's been a slow week at the SVC, but coven leader Ryah *does* have some big news that will merit its own post. I haven't posted in quite a while, mostly because of my laziness, but also because I've been sick. Luckily I heal like a werewolf - just had to take a trip to the SVC pharmacy. 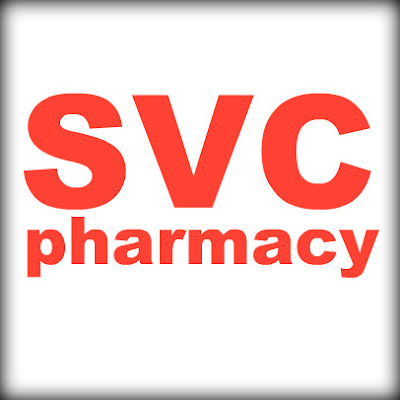 Yes, that's right, I just noticed that SVC is CVS backwards. Amazing. I also noticed that "SVC" was on the screen at check-in at the airport in San Diego, and I've seen it other places too. What other fantastic places share our acronym, I wonder? Bitten by Erin at 9:58 PM 1 enjoyed the bouquet.